The days leading up to the tri I tapered my training and kept my meals consistent with what I’d been used to eating. The day before the race I had three square meals with slightly more carbs in each than I would normally have, a race routine I’m used to. We all (myself, my husband, and my brother-in-law) went to bed at a reasonable hour with a 5:45 a.m. alarm set. As happens before any race, I woke up several times to make sure I didn’t miss the alarm and at 5:30 I was ready to get going. We packed our gear into the truck and loaded the bikes onto the rack in a light rain and hoped that the predicted 70% chance of severe thunderstorms would not cause the race to be cancelled. By the time we arrived to the race, the rain had stopped and it stayed dry but overcast for the duration of the morning. 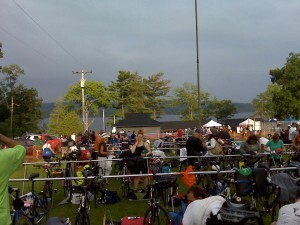 The sight of all the bike racks, the Cazenovia Lake in the background, and athletes milling around got me super excited. I followed my husband to a middle bike rack that was equi-distant between the bike in/out and the run out gates. A bike several down from ours had a balloon tied onto the rack next to it and I’d like to give a huge thank you to the person who brought that balloon as I have no idea how else I would’ve found my bike during transitions. Before the race setting up my stuff; I kept my goggles and swim cap inside the pocket of my Gracie's Gear jacket until it was time to go. We had arrived a good hour and 45 minutes before our swim would begin (the Olympic distance triathletes began at 8 a.m. and our start time was 8:30 a.m.) and had plenty of time to go through body marking and get our chips and race numbers for the run. It was fun going through the process of setting up my gear for transitions and thinking through what my strategy would be during each transition. The one thing I had wanted to get before the race was a number belt so I wouldn’t have to pin my race number to my spandex shorts or top but it didn’t happen. Fortunately, the local Fleet Feet store had some for sale and I was quick to make that purchase rounding out my gear for the day. After hitting up the porta-pots several times, jumping around to keep warm, and mentally preparing for the swim it was finally time for the first wave of sprint triathletes to start. I was in the second wave and watched my husband’s strategy which I planned to follow. When it was time for the white caps (my group) to start I ended up being the last one in the water and because one of the race volunteers was counting as we went in I knew that I was the 43rd person in the group. I stayed to the middle back of the pack and as we stood in chest deep water, shook and rubbed my arms until it was time to go. When the call was made I started my Polar heart rate watch and as my husband had done I did a little dive forward and was instantly shocked with the cold temperature of the water (it was 71 degrees). There were a lot of athletes in wetsuits but I was happy in my Pearl Izumi tri shorts and Speedo tankini with built-in support top. My body warmed up quickly but I found it tough to do my normal four strokes and then breath. Actually, it was tough to do any normal stroking for almost the first full leg because no matter what I tried I was hitting other swimmer’s feet and arms and it took a while for us to space out. It was very windy and the first leg was straight upwind pushing us inside the triangle so it took extra effort to make sure we stayed on course and didn’t miss the mark. From the first mark to the second it was all downwind and I used that time to try to get into a rhythm and calm my breathing. Overall I did have to breast stroke a few times to make sure I was on course and to see where I was in relation to other swimmers; for my first time I am pleased with my swim performance but I definitely have room for improvement. The last leg we had the wind blowing waves right into our faces and the waves also made it tough to swim with any consistency or efficiency. 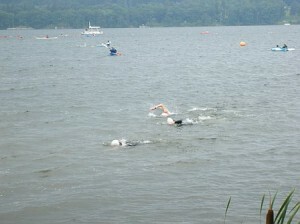 As soon as I could stand I was making my way out of the water, had my cap and goggles off, and was jogging uphill to the transition area. 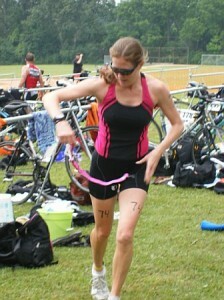 I know I was smiling and I was simply stoked to finally be doing the triathlon. Note the balloon in the background; what a lifesaver for finding one lone bike in a sea of bikes! Back at the transition area I had a little towel handy, wiped my face quickly and stood on the towel while I put on sunglasses and my helmet. Despite the fact that it was not sunny at all I had no desire to ride without glasses for fear of my eyes drying out and getting things stuck in them. Getting socks onto still relatively wet feet was a challenge and I am intrigued by the possibility of going sockless; my brother-in-law did this and swears by dumping lots of talcum powder in the shoes and says it works like a charm and is comfortable. Getting my Shimano shoes on and bike out of the rack is somewhat of a blur and as I got to the mounting line, a volunteer held the back of my bike so I could clip in. Let me say here a huge THANK YOU to all the amazing volunteers! We had been warned to start in a low gear because it was uphill out of the transition area and while I could have been in a lower gear at that moment, that hill was nothing compared to what was to come. Wind and hills–that about sums up the bike. I felt like molasses most of the time. I worked harder than I’ve worked on any training ride and felt like I could make no progress. The hills were a variety of steep, long, gradual, short, and while they did alternate with some downhill and flat stretches there never seemd to be enough of those for me to catch my breath. As I was passed on the hills by many riders it dawned on me that while I have the endurance to go for long periods of time I don’t necessarily have the strength to push up hills without losing some of that endurance. If I can add strength routines back into my work-outs I imagine my hill performance will improve. The entrance back to the transition area was downhill and I had a little more speed than I should have coming in so unclipping, dismounting, and running my bike to the rack was a rushed and clumsy effort to say the least but I was excited to be starting the run. Going the wrong way trying to get the new race number belt on; a piece of gear I am very grateful to have! My bike to run transition was not really smooth. My helmet went flying, I struggled getting the bindings to the shoes undone, and I was so focused on just getting my running shoes on that I didn’t pay close attention to how well I was tying them and I didn’t double knot the way I normally do (none of this ended up mattering). I was also so focused on trying to clip on the race number belt that I started running out the way I had come in with my bike. Fortunately my family was within earshot yelling to me that I was going the wrong way; I shouted back “good to know!” and got turned around to head out the proper way. I started out fast and felt it instantly as I went up the hill to get out of the park. After that exit though the road flattened out and I finally started to catch my breath for the first time since starting the swim. Stretching out across the finish line. Immediately after the race I was on cloud nine. If I thought I was amped up with adrenalin and excitement before the race it somehow doubled by the time I was finished. The triathlon was so different than a running event though I can’t put my finger on what exactly makes it different (aside from the obvious swim-bike-run). I felt elated to have finished, I was thrilled with my total finish time of 1:37:12 and even more so with my splits for my first sprint triathlon. Not long after the sprint was finished did my thoughts start to center on the training still to be done for the next triathlon, an Olympic distance event at the end of September. I know that I want to improve my biking performance and I can definitely improve my swimming form and lung capacity in preparation for a mile swim. Now a couple days after the sprint I still smile just thinking of the event overall. It really was awesome. I learned a lot and I’m sure those thoughts will come out in future blog posts. I’m also excited to apply what I’ve learned to the next event. What about you? How did you feel after your first triathlon? What did you learn? Thanks Nick! Any tris in your future? GREAT JOB on ur Tri! I am doing my first tri in October and I am NERVOUS! Great Job on your first Tri! Love the write up. My race write ups I send my team are not near that good, that was great. Make sure you sign up for the Columbia Tri for next year, I will put something on facebook. Again, Great job!! Hey great race and personal achievement. 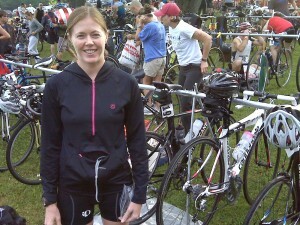 I remember my first tri and reading about yours sounded just like how I felt 15 triathlons ago. The Olympic race you have scheduled is going to be twice as far- 3 times harder- but you will feel 10 times better when you finish it!! Thanks everyone for taking the time to read this review! Mike, I’ll look at the Columbia tri, it’s safe to say I’m hooked and would like to do more. Its blow-by-blow reports like this I find the most helpful. Thanks for helping me (and many others) anticipate my first tri. Hi Michael! Glad this was helpful! Most of my write-ups tend to be play-by-play only because I’m pretty wordy. 🙂 Good luck in your first tri! Was so happy to read of such great success on your first….and that you already have a date and goals for the second. Way to go! 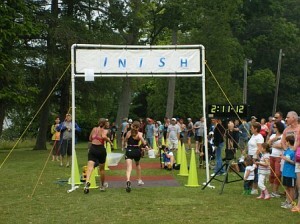 Congratulations on your first sprint tri- I’m sure there will be many more in your future! Your post reminded me of my first tri (Danskin Seattle- 6 yrs ago) which then led me to do the Kirkland tri and other 10k runs. I guess I better get off my fanny and start by walk/jogging again. Like your blog very much~ much success! Lynne, thanks for checking out my blog! It’s been fun to continue to hear about other athletes first tris. I imagine the Seattle tri you did was awesome, such a great city. Good luck with whatever next race you choose! Thanks for the informative post. Triathlon sports have seen exponential growth in past 10 years. After the camp I understood importance different types of training sessions. I am preparing for my 2nd sprint tri on Saturday, but it is my 1st with an OWS. Your description of the swim was just what I needed! I’ve been fearing the water temp & my lack of a wetsuit. But, I think our water will be about 73, so I should be fine! As far as m first tri (3.5 weeks ago), I’d totally forgotten how long it took me to catch my breath when I started biking! It was tough! Thanks again for sharing. This post has really helped to ease my mind! a comment here! Merely wanted to admit you actually did a tremendous job. I’ve trained for a couple of marathons but I’m still very much an amateur marathon runner. During the training of NYC this year, I experienced Planar Fasciitis for the first time. I took a month off in August and it seems to be slowly getting better. Can you recommend any treatments aside from “typical” stretches and rolling the injured foot on a frozen water bottle? Should I be concerned that other runners have told me that this ended their marathon careers? Finally, to keep busy while not running, I’ve been playing indoor soccer..thoughts on how terrible this is for planar Fasciitis? Thanks!